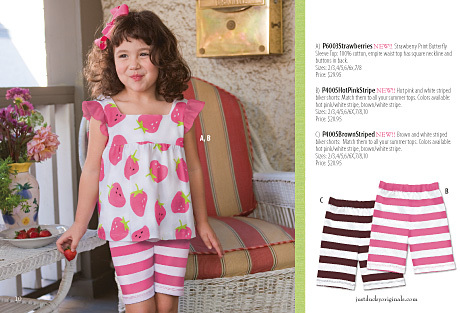 Large Strawberry print shown here in the Just Ducky Spring 2010 catalog. For Just Ducky’s Spring 2010 collection a fun oversized strawberry print was developed specifically for their new style Butterfly Sleeve Top. Keeping to simple, strong colors – pink, lime, brown – mades for a print that is big and bold, yet not overwhelming. Very summer!